Summer Spotlight: Lego Robotics and Guest Teachers! It has been such a joy speaking with families enrolling in our summer program. We have some exciting news to share: we're adding Lego Robotics to our summer program offerings, and will be welcoming guest teachers from other BASIS.ed schools to Brooklyn for the summer! BASIS Independent Summer is all about connecting our Brooklyn families to the best that the BASIS Independent network has to offer. One way we accomplish this is by bringing some of the best teachers from our sister schools to serve as guest teachers in our summer program in Brooklyn. Leading our History of Medicine and Engineering and Architecture programs will be Ms. Mrunali Das of BASIS Scottsdale. Ms. Das is a gifted and passionate educator who currently teaches Math and Psychology, and was also responsible for developing and teaching at the Math summer program last year at BASIS Independent Silicon Valley. This 2 week introductory robotics program uses the Lego Mindstorms Robotics framework to introduce students to engineering and technology ideas. Robotics is a discipline within Engineering that combines building mechanical bodies with programming logic to solve problems. 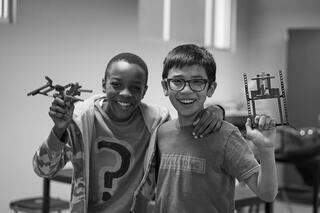 Students will build a sample of simple robots to solve problems with real world applicability. On the last day of the program students host a robotics competition, which parents and family are encouraged to attend. Students can choose to enroll for 1 or 2 weeks. This is a half day program that accepts students entering grades 1-9 in the fall of 2016. The morning session is for students entering grades 5-9 and the afternoon session is for entering grades 1-4. Leading the Lego Robotics program is Ms. Julie Cameron from BASIS Phoenix who currently teaches their 1st-4th grade Engineering classes and has an impressive Lego Robotics background. Ms. Cameron co-sponsored the BASIS Phoenix Lego Robotics team leading up to the FLL (FIRST Lego League) tournament. She has been a competition judge for four years, assessing the kids' technical and presentation skills. This year she also worked with a high school robotics community team (Si Se Puede in Chandler) to prepare for FRC (FIRST Robotics Competition), the high school version of the LEGO team. We anticipate these programs will fill up quickly, so be sure to register and secure your child's spot. Visit the BASIS Independent Summer webpage for full program information.